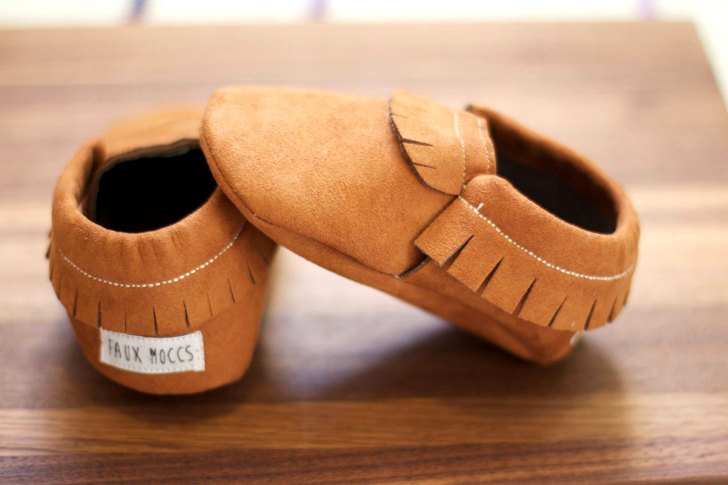 Faux Moccs is an online, vegan, cruelty-free clothing store with a specialist line of handmade, vinyl-free and vegan moccasins for little ones' feet. Shop owner Kortney is of Cherokee heritage, and Cherokee culture has always been something her family has embraced – from Native American medicine practices to searching for arrowheads and artifacts. When Kortney learned about the cruelty that went into animal farming several years ago, she had to go vegan, but while she threw out every piece of leather she owned, she was heartbroken at giving up her moccasins. When she had her son a few years later, she knew that moccasins would be perfect for his growing feet, but she couldn't find any that were not made of either leather or vinyl. 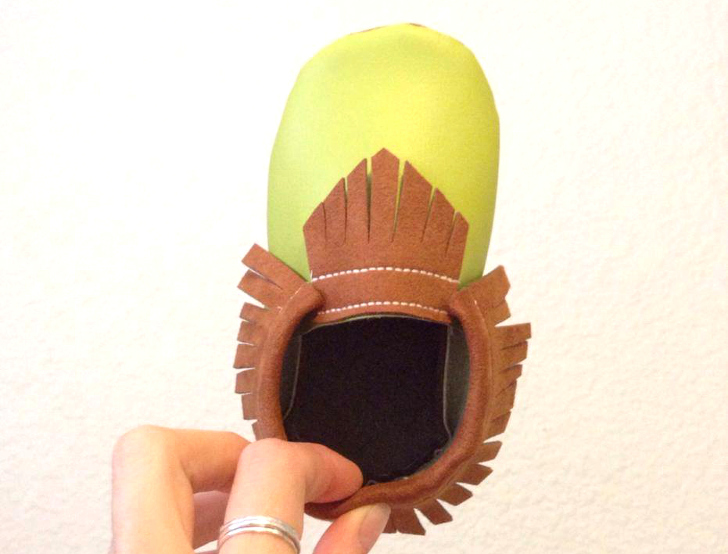 And so Faux Moccs was born! Moccasins, as a soft-soled shoe, protect young feet while still allowing them the freedom to develop and move like bare feet. Kortney says each pair is made with love for all life in mind. The name Faux Moccs is pronounced “Fox Mox” as a play on words referencing the use of animal furs and skins in the fashion industry compared to the “faux” label given to non-animal derived shoes and accessories. All Faux Moccs are made of 100 percent nylon or polyester fiber matrix and are free of harmful chemicals, PVC, vinyl or plasticizers. The moccasins can be hand washed and air dried. Faux Moccs come in a multitude of colors, from winter neutrals to playful brights, and customized contrasting fringe colors can be ordered upon checkout in the online store. Similarly, if your child has wide or narrow feet, this can be accommodated when their moccasins are made if you add a note to your order. Sizing ranges from newborn to U.S. child’s 11, though there is a handy size comparison chart on the website to be sure of proper fit. Kortney recommends sizing up if in doubt. Because each pair of moccasins is made to order, items will ship about three weeks after ordering. Faux Moccs retail at $50, with international orders welcome. The shop offers occasional sample sales and discount codes, and all sales and giveaways are posted on their social media accounts on Twitter, Facebook and Instagram. Moccasins, as a soft-soled shoe, protect young feet while still allowing them the freedom to develop and move like bare feet. Each pair is made with love for all life in mind. The name Faux Moccs is pronounced “Fox Mox” as a play on words referencing the use of animal furs and skins in the fashion industry compared to the "faux" label given to non-animal derived shoes and accessories. All Faux Moccs are made of 100 percent nylon or polyester fiber matrix and are free of harmful chemicals, PVC, vinyl or plasticizers. The moccasins can be hand washed and air dried. Faux Moccs come in a multitude of colors, from winter neutrals to playful brights, and customized contrasting fringe colors can be ordered upon checkout in the online store. Sizing ranges from newborn to U.S. child’s 11, though there is a handy size comparison chart on the website to be sure of proper fit. Kortney recommends sizing up if in doubt. Because each pair of moccasins is made to order, items will ship about three weeks after ordering.